As I mentioned in yesterday’s blog, I picked up some samples of Honest Kitchen dog food to try out on Ellie. I picked up a trial sized packet of each of the foods made by Honest Kitchen – Force, Embark, Preference and Thrive. The samples were kindly provided by the Canadian distributor of Honest Kitchen, Companion Dog Xpress, located right here in Durham, Ontario. Thrive is our gluten-free, low carbohydrate dog food. This diet was designed to cater to dogs of all life stages including adults, puppies, pregnancy and nursing. Thrive is ideal for sensitive dogs who need gluten-free dog food but with a little grain, to help maintain a healthy body weight. My initial impression on opening the package was that it smelled strongly, but not unpleasantly, of kelp. The color reflected this – in appearance, Thrive looks something like finely ground grass clippings. This makes sense, when you realize that the fourth through seventh ingredients of Thrive are Spinach, Parsley, Organic Kelp, and Rosemary. I followed the feeding recommendations, and mixed a cup of dry food with a cup and a half of lukewarm water. Roughly ten minutes later, the food was the consistency of thick soup. In hindsight, I think that the water to food ratio I followed was too high, especially when preparing it for a dog who has difficulty with differently textured foods. Ellie took one look at the bowl of Thrive, and turned her back on it. After a few minutes, she deigned to sniff it warily, and lap up a few mouthfuls. The mournful expression she turned on me clearly said “Have you lost your mind? I’m not eating this.” And, sure enough, two mouthfuls were as much as she ate, and this in a dog who usually clamors for her food. Honest Kitchen will not be Ellie’s new food of choice, so we’re back to soaked kibble for now. I split the bowl of Thrive into two portions, and fed it to Paris and Tula. They both inhaled it in less than a minute, and knocked the bowls around in an attempt to clean out every last particle of food. Apparently some dogs really like Thrive – but bear in mind that Tula and Paris are the most food motivated dogs I own, and would happily wood chips if given the opportunity. The finely ground texture of Honest Kitchen’s food made me consider how suitable it might be for a weaning food. 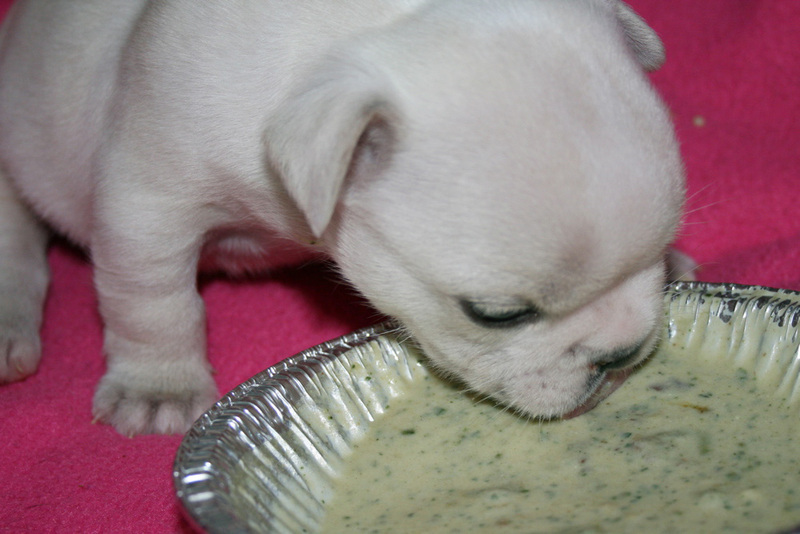 I usually follow the same protocol when weaning our puppies: start them on rice pablum mixed with formula; move up to ground kibble mixed into the pablum; add raw at an increasing rate until the pups are eating raw only. I then feed the pups soaked kibble one meal per day, in an effort to ensure that any new owners who choose not to feed raw aren’t faced with overly fussy eaters. The whole process takes about two weeks. The problem with ground kibble is that I’ve had pups who cough or choke on it. The texture is grainy, and doesn’t agree with a lot of puppies. Honest Kitchen is so finely ground that I decided to give it a try on Solo this morning. He’s been eating pablum mixed with formula for about a week now, and I had been planning to introduce ground kibble to his diet this weekend. I decided to try mixing in some Embark, instead. Hormone-free USDA turkey, organic flaxseed, potatoes, celery, spinach, carrots, coconut, apples, organic kelp, eggs, sesame seeds, bananas, cranberries and rosemary. I mixed a teaspoon of Embark in with the tablespoon of pablum, added warm formula, and left the mixture to sit while I fed Solo his bottle. After about fifteen minutes, the mixture was slightly thicker than pablum on its own. It had tiny flecks of green, orange and brown in it, and a pleasant smell. Solo seemed really enthused about trying it, and lapped up the entire dish, even licking it clean afterwards. It’s been a few hours since he ate, and there’s no sign of any stomach upsets or diahrrea. I’ll keep feeding him the Embark this weekend, and if there are still no stomach upsets, I think I will officially consider it my second stage weaning food, replacing ground kibble. I like that it’s a raw food, that it’s not extruded (or even baked), and that it’s made with organic, hormone free meats. It’s always nice to find a new food I feel comfortable feeding, and that the dogs seem to enjoy – even if I still can’t get Ellie to eat it.